If you want to help your business succeed in the long-term, you need to increase customer retention. Fail to do so, and you’ll have to find new customers regularly to keep your business going. It’s tough to find new customers for your business. But if you put your effort into retaining your existing customers, you’re likely to get better results. To retain customers, you need to build up brand loyalty and manage customer relationships in a better manner. But before we get into how you can increase customer retention, you need to know why your customers are leaving you. Why are Existing Customers Leaving? To find the solution to your problems, you need to first find their root cause. If your goal is to increase customer retention, then it’s a good idea to step back and analyze why people are leaving you. When you know these reasons, you can tackle them and improve the customer experience. With improved customer experience comes better customer loyalty and satisfaction. One way of doing this can be via emails. Whenever a customer terminates their account, you can send them an email to ask them what went wrong. Many customers may respond to this with feedback and through that, you’ll be able to pinpoint the mistakes. Then you can help you rectify those mistakes, and prevent them from happening again to improve your customer experience. You need to take note of all of the responses that you get. Especially the negative ones. These are the ones that can help you improve your brand and customer experience. You could also use surveys to collect feedback. Now that you know what may have gone wrong with your customer experience, you can improve it. Here are a few of the best ways to do it so that you can increase customer retention. Customer experience plays a major role in determining your customer retention rates. Customers leave brands when they are unsatisfied with the experience they had. The importance of customer experience cannot be overstated. It is so important that, for a brand making $1 billion yearly, a slight increase in customer experience resulted in an increase of $823 million in revenue over 3 years. There are two steps to improve the customer experience. The first involves collecting customer feedback that can give you insights into the satisfaction level of current customers. The second part involves improving parts of your business that can increase customer retention. Your collection of feedback shouldn’t be restricted to only the times when a customer leave your brand. It should be an ongoing process. In fact, after every purchase, you should ask your customers to review the product that they’ve purchased. You can even ask them to rate their overall shopping experience. This can help show them that your brand cares about them. This feedback can even help you improve your products and services to suit their needs better. You should also strive to get as much feedback as possible. You should conduct regular polls and surveys through emails and social media. Not only will you get additional insights but these can even serve as great ways to engage your audience. The improvement in customer experience should start right from the on-boarding process. You need to make sure that the customers understand how to use your product effectively without much hassle. Then, throughout the time when they are your customers, you need to do your best to create a positive customer experience. One of the best ways of improving customer experience is through live chat. It proves to be an effective tool for immediate problem resolution for customers. So they know that whenever they have an issue, there’s always someone who’s ready to solve it. This can improve your customer relationships tremendously. You could buy live chat solutions or could simply link to Facebook Messenger on your website for customer support. You should also make sure that the live chat is easily visible and accessible by the customers. Your retention rates could suffer if it’s hard for them to find it. If your customers receive good service from your end, they may even end up spreading the word about it. They could do this in their immediate circles or even on social media in the public domain. This can help you get more customers too! However, they may also do so when they face some negative experience. In such a situation, you must step up and address their issue as quickly as possible. That can help improve your brand image in the public domain. Many customers may leave your brand if they feel that you don’t care for them. While you may be doing your part in improving their experience, you need to ensure that they don’t feel ordinary. You need to give them special treatment and care for them. This is where loyalty programs can come in handy. A loyalty program can offer that added bonus to customers who have stuck with you for a long time. 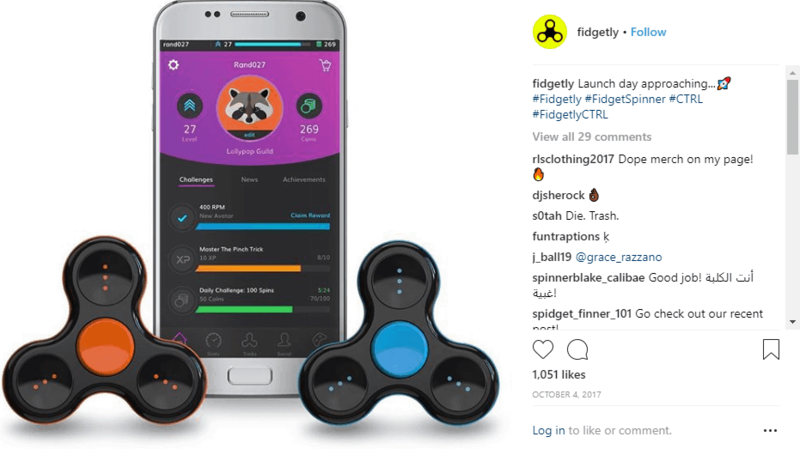 It can not only improve your relationship with them but also puss them to make repeat purchases. Another way of doing this can be by creating a sense of community. The simplest way of doing this can be by starting a Facebook Group. You can also improve your relationships with customers by sending them a thank you note via email. This will show them that you appreciate them for supporting you. Which can make them feel valued. Don’t wait for your customers to raise issues or come asking for help. Take the initiative and check in on them regularly to find out how they are doing. This will strengthen your relationships with them and show them that you’re always there to help them and care for them too. Generic offers may not give customers enough incentive to buy from you. For instance, say you’re offering headphones on discount but your customers are looking for speakers. In such a case, the discount likely won’t be enough of an incentive to push the customers to buy from you. You should make a special effort to personalize your offers for your customers. Predictive analysis can help with this. It analyzes their behavior and predicts how they are likely to act. This analysis can take buyer interests and preferences into account from previous purchases. By analyzing this data, you can predict their future behavior. You also need to take their age, gender, location, and other demographics into consideration. Based on these, you can then craft special personalized offers for them. Many small businesses, even large one like Amazon and Netflix, use this method to personalize suggestions. It’s advantageous for the customers too because it gives them exactly what they want. Customers may get distracted while shopping. They may have added a product to their cart but, due to the distraction, they may have abandoned it. You need to make sure that you don’t lose out on these customers. A great way of doing this is by sending out follow-up emails. You can schedule emails that will gently remind them about the items they have abandoned in their carts. These emails should also contain a call-to-action (CTA) button. This makes it easy for the customers to finish their orders. All they need to do is click on the button and then check out. You can also use predictive analysis to figure out how long a product may last. Sephora uses this method to increase their customer retention. You can send out reminder emails just when the products are expected to run out. This can push the customers to purchase the product as it comes back to the top of their mind. Sephora even adds the loyalty points that the customers have gathered in these follow-up emails. This serves as an added incentive for the customers to purchase from them again to increase their loyalty points. They also use free trials, makeovers, and exclusive discounts to push for more repeat purchases. 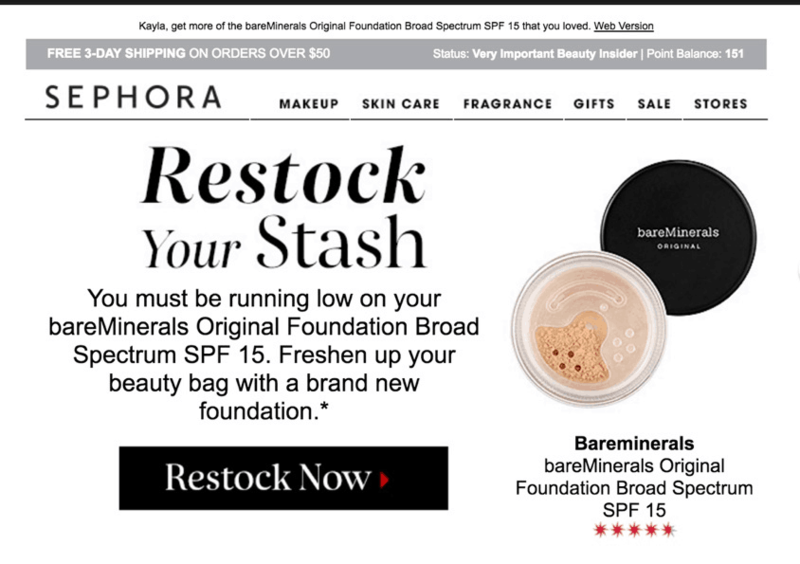 For instance, Sephora sent out this email just a week before the product was estimated to run out. It gives a clear call-to-action to restock the product. Through this method, they are able to retain more customers and encourage repeat purchases. It is a great idea to collect information about your customers and their buying behaviors. You can then use predictive analysis to segment these customers into groups. Through this, you will be able to analyze each segment separately. Segmentation can even help you create content based on their preferences. You may also need to adopt different methods of servicing them to increase customer retention. On further analysis, you will be able to figure out which segment responds the best to each of your promotional efforts. Based on the data from each segment, you can then create better customer experiences for them. Personalized content and discounts can be then sent out to them. For instance, if your target segment is millennials, you should push for better visibility on Instagram and Snapchat. However, if you want to target businesspersons, you should be looking at LinkedIn. Liftpoint Consulting, for instance, did customer segmentation based on the amount spent to purchase their services. They further segmented the customers on the basis of their potential to purchase from them again. Based on this, they crafted marketing strategies for each segment which resulted in a 40% increase in sales. The better and deeper your segmentation is, the better insights you’ll be able to get. These insights will help you craft a better marketing strategy that relates better to each segment. You can use predictive analysis to not only assess your current customers but even potential ones. To get high-quality leads, you need to understand the buying behavior of potential customers. This can only be done on the basis of their past purchases. It can help you understand what they may want to buy in the future. Once you know what they may want, you can figure out if they are likely to make a purchase from you. Then you can focus on customers who are most likely to buy from you. As a result, your ads and marketing campaigns will be targeted better. You can even expect to get more leads and a higher conversion rate from these campaigns. Remember, you need to win your customer’s trust. By default, they will always be skeptical about your brand. Even one negative experience may be enough for them to break ties with your brand. To avoid such a thing from happening, you need to ensure that you’re being completely transparent with them. You should be straightforward about all your policies and terms. These should also be freely available on your website for your customers to access anytime. This can not only improve their trust but can even increase customer retention. If you’ve been in the business for a while, you may have a huge database of customers who’ve bought from you. A lot of these customers may be inactive. All they may need is a slight push from your side to make a repeat purchase. You can do this by offering them a discount. It is then important for you to improve your relationships with them and then find out why they lost interest. Based on their input, you can rectify the issues and increase customer retention. Affordable and good quality products can easily catch the attention of customers. They may even add those products to their carts and head to your check out page. However, they encounter a big increase in the final price in the form of shipping costs. There are great chances that they may be disappointed and may even abandon their carts. Usabilla conducted a survey of 2000 retail shoppers in the U.S. One of the main reasons for cart abandonment turned out to be high shipping costs (58%). Yet another issue that was pointed out by shoppers was that of the shipping speed. There was a time when free shipping was a novelty. However, today it is extremely important to provide free shipping to your customers. Not only does it help you get new customers but it even helps you increase customer retention. Free shipping can tempt your customers to stick with your platform just so that they can avoid the excess shipping fees. They may even remain loyal to the brand and may spread the word about free delivery too. Amazon, for instance, offers free delivery their customers who are enrolled in their Amazon Prime membership program. While consumers do need to pay for this membership, its benefits clearly outweigh the costs involved. You must also try to come up with such innovative strategies to provide free shipping and increase customer retention. You may have managed to deliver the best of your products within the stipulated time. Furthermore, you may have provided free shipping too. But the customer may, for some reason, want to return the product. In such a situation, it isn’t your job to sit back and figure out the reason for this. Instead, you should focus on making it easy for the customers to send the product back. An online store that has a flexible return policy may seem like a better option for customers over one that doesn’t. Customers won’t want to go through a hassle to return the product. Instead, if you can provide them a free doorstep pickup service at their convenience, it improves their experience. While this can increase customer retention due to the good experience, you must try to minimize the returns. To do this, you should provide as much information about the products as possible to the customers. All the features should be clearly listed. If it’s a physical product, its dimensions and colors should also be listed. If you’re selling apparel, you may want to add apps that can help your customers choose the appropriate sizes. Additionally, while processing the return, you should send out a questionnaire. This should ask them about the reasons for their return request. It will help you understand the reasons better and rectify them. Working on this feedback can also help you to increase customer retention. To increase customer retention, you must ensure that you provide a good customer experience. Building healthy customer relationships can also help in the process. The entire shopping experience of the customers should be also smooth. Free shipping and smooth returns can further increase repeat purchases. It is a good idea to personalize offers and discounts for your customers to make them more attractive. You should also do customer segmentation to understand them better and tailor your services to fit their needs. Regular follow-ups, better transparency, and engaging with inactive customers can also increase customer retention. Which methods have you used to increase repeat purchases? Let us know in the comments.